How many variations do we really need? Okay Topps… We get it. You like to make variations of the same card. I have 8/10 cards of the rainbow. Yes. There are, in fact, 2 more variations! They are, however, both 1/1’s (Red and Superfractor). Last week, Topps released Series 2 to their base set for 2013. With it comes another onslaught of multiple variations. Every base card has a white base version (1). A red Target exclusive parallel (2). A blue Wal Mart exclusive parallel (3). A purple Toys R Us exclusive parallel (4). And then a few pack inserted parallels: Emerald Foil (5), Gold serial #’d/2013 (6), a salute to the military with their Camo serial #’d/99 (7), a tribute to breast cancer Pink serial #’d/50 (8), a black bordered serial #’d/62 (9). And then there are the Silver Slate redemption packs: Blue Silver Slate (10) and Silver Slate serial #’d/10 (11). That’s right folks. Every card has 11 separate variations for all of your collecting desires. And I am guilty as charged! I want every variation for my beloved Oakland A’s. 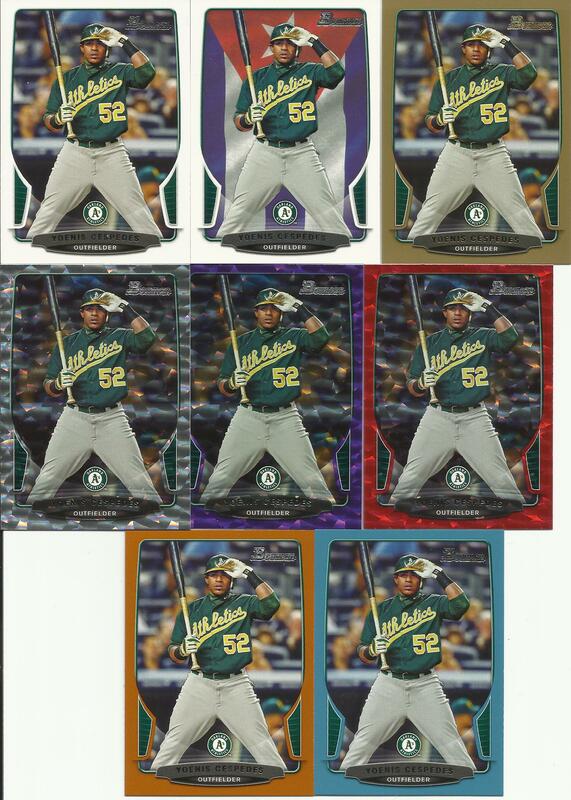 And at last check, Topps inserted 15 different A’s players into the Series 2 checklist. Thanks Topps! That’s 165 cards that are on my Christmas wish list. At $5 a piece… I have to explain to the wife where that $825 just went. Unfortunately for me… They aren’t $5 a piece. The Silver Slate /10 and Black bordered /62 can get quite pricey. So let’s just say that there are 9 “affordable” variations… bringing our $5 per card total all the way down to $675! Does anyone have $2,000 I can borrow? Also… There are autos. And relics. And auto/relics. And inserts. And SPs… OH MY! I have some guy named Bowman and all of his variations on call waiting. And his brother Bowman Chrome is also calling. Their cousin Bowman Draft also wants to make an appointment. Bowman Draft Picks and Prospects wants to be on Tier One of the appointment list. I just had a walk-in wanting to make some kind of Tribute to the past. Someone is on hold wanting to discuss their Museum Collection. A lady from the Archives department is holding as well. A representative from Allen & Ginter called and left a message while I was at lunch. Sounds like a law firm to me. Bowman Platinum and Sterling must be wanting to sell me some kind of jewelry. I can make reservations at the Finest restaurant. They have 5 Star service. Just don’t sit in the back by the bathrooms. There’s a Gypsy Queen who usually sits back there. Mom just texted me wanting to discuss our family Heritage. She seemed upset also. She must have figured out that our pet Turkey is Red. Well enough about all the different variations of Topps Series I, II and Update. I am off to detail my rims. I have to polish the Topps of the wheels with a Chrome finish. Who needs a Checklist anyway?